I’m happy to report that the response to my book, from both leaders in the field and parents around the world, has been extremely positive. Below I’ll share a sampling of these impressions, along with links to interviews in which I talk about the book on audio or video. First, though, please let me make another appeal for your support. 1. If you haven’t read the book yet, I’m confident it can give the same kind of empowering boost to your bilingual journey as it has with hundreds of other readers. At the same time, the proceeds from this book make it possible for me to keep Bilingual Monkeys and The Bilingual Zoo going and growing! All this online content is free—and I want to keep it free—but it’s also true that it’s getting costly for me to maintain these two sites. This means that your purchase helps us both in important ways! Maximize Your Child’s Bilingual Ability is available worldwide, in paperback and as an e-book, at Amazon and other retailers. 3. Please continue to tell others about the book. Your support through word-of-mouth is another key factor in exposing the book and its value to other bilingual and multilingual families. You might even consider gifting a few copies of the book, too—it makes a nice present! Thank you! I honestly don’t like “selling” the book, but I believe deeply in its value to other parents and providing support so that families worldwide can experience greater success and joy on this marvelous journey is at the very heart of my work. Note: If you’re interested in reading and reviewing my book for your website or publication, please email me directly. 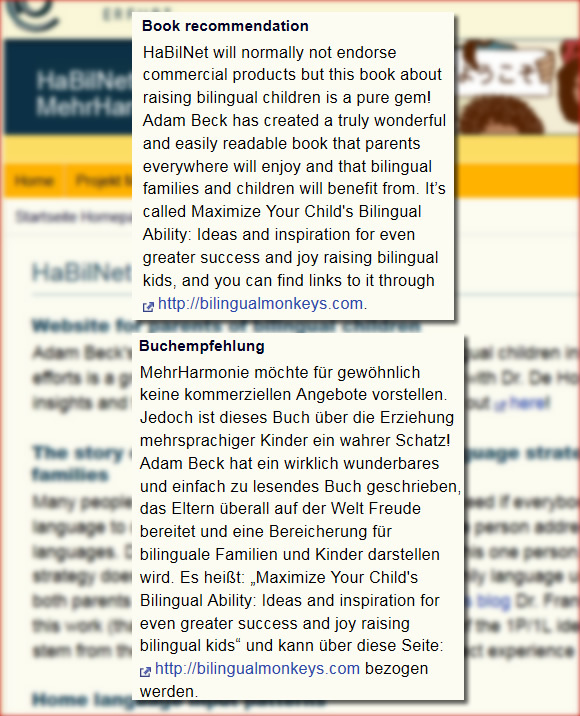 Annick De Houwer, one of the world’s leading researchers on bilingualism in children and author of the seminal books Bilingual First Language Acquisition and An Introduction to Bilingual Development, has endorsed my book (in English and German) on her website at the University of Erfurt, in Germany, where she serves as a professor of language acquisition and multilingualism. “As a mother raising bilingual children, and professionally, as a speech-language specialist, I’ve read and written extensively on the area of bilingualism. There are so many resources readily available out there for bilingual families, but Maximize Your Child’s Bilingual Ability is uniquely special. 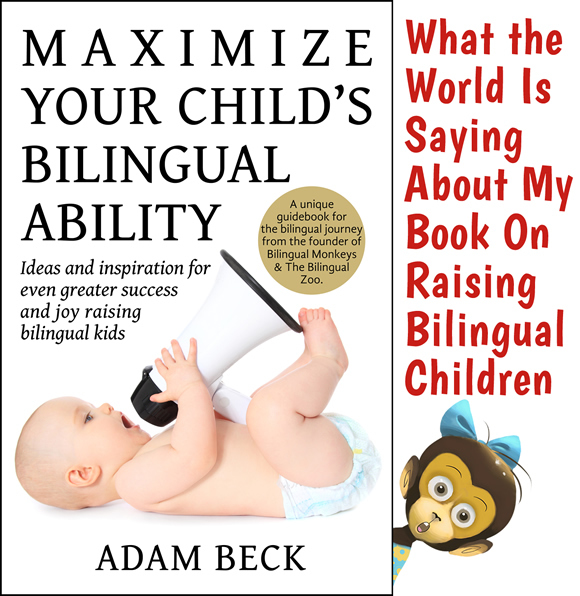 Adam’s use of perspectives (ways of thinking) and principles (ways of acting) will certainly bring about right thinking that leads to right doing when it comes to fostering active bilingual language ability in children. His use of effective analogies and metaphors also enable key concepts to seek in deep and remain as crucial elements in the foundation that must be laid in order for us, bilingual parents, to reach our hefty goals. “… the ideal guidebook for parents who are sure of their commitment to bilingual parenting but in need of ideas and ongoing inspiration. That covers every bilingual parent, including me! If you’re a few years into this journey of bilingual parenting, you know how easy it is to slip into a state of discouragement. After all, the more you learn about raising bilingual children, the more you are reminded that the journey is an uphill one. From his own experience, Beck is highly aware of the difficulty of the task, and yet he remains immensely practical and positive about the possibilities and outcomes for both parents and children. I couldn’t be more grateful for his experience and realistic optimism, and I definitely came away with several new ideas for boosting my children’s bilingual abilities. “Adam offers tons of concrete suggestions for making the most of the time you get with your kids. Here you’ll find practical ideas you can implement right away– from using books and games, to communicating with extended family, to storytelling and keeping language-learning lively. This is the kind of resource you can come back to year after year, as your circumstances change and you need to tweak your family plan. Olena Centeno, founder of Bilingual Kids Rock, reviewed the book and read excerpts from it in this podcast episode. Many positive reviews have been made at Amazon, the global Amazon sites, and Goodreads. “A must read! I very rarely say ‘you must read this’ but if you are a parent or carer raising children bilingually, or thinking about doing so, look no further. We are parents to a two year old boy and a three month old girl and have found this book incredibly helpful and informative. Prior to our son being born, we both researched around the subject of how to best support him to become bilingual. Maximize Your Child’s Bilingual Ability is such a welcome break from the usual dry academic resources. If you are going to read one book about raising bilingual children, make it this one. Marianna Du Bosq, founder of Bilingual Avenue, invited me to chat about the book and my own bilingual journey in this podcast episode, a conversation that ran nearly an hour. Joy Jarman-Walsh, of GetMagazine magazine, dubbed me “Hiroshima’s bilingual child whisperer” in this article and 30-minute audio interview. Amanda Hsiung Blodgett, popularly known as Miss Panda Chinese, and I enjoyed a lively conversation about a range of issues related to raising bilingual kids in this videotaped interview. Christa Jimenez and Heather Robertson-Devine, the team behind BilingualWe, interviewed me in this videotaped episode via Google Hangouts. Everyone, thank you for your interest in my work and your generous support! Best bilingual wishes to you all!